Prior to beginning college, I was unsure of what I wanted to pursue as a career. I was always bombarded with the questions “So what are you going for? What’s your major?”, and reluctantly I would always answer “I’m not sure yet”. Now, as a second semester freshman at the University of Wisconsin – Whitewater, I’ve decided to major in business. Since I began college, I am more confident in my ability to become successful in the future. This is not only due to myself, but my mentors Chris Corley and Steve Chevalier. This past January during the 2018 RCM Scholarship Brunch, I spoke to both of my mentors about my future plans and how I decided to change my major to business. They provided me with encouragement and helpful tips for narrowing down my major even more. One of my mentors, Steve Chevalier, happens to have a background in accounting, and due to our conversations, I became interested in the field. As a result, this upcoming fall semester I will be taking my first accounting class. For these reasons, I am not only grateful to the RCM Scholarship program for awarding me with a financial scholarship, but for the leadership and guidance my mentors provide. Without it, I wouldn’t have as much confidence in myself as I do now. I plan to volunteer at Rotary’s 2018 Scholarship Golf Classic on Monday, June 11th. I hope to see you there so I can thank you for Rotary’s support! 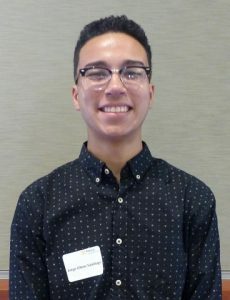 Jorge is Rotary’s Gordon & Elizabeth Smith Scholar, which was established in 2012 by Tom and Genie Smith in honor of his parents. The first scholarship of $4,500 was awarded in 2013.